The Nine Dragon Wall Screen was housed in a separate section where you had to pay another $10yuan entrance fee, which also granted me access to a museum of various imperial jewleries they had on display. These jewlery they had on display included gold bracelets, jade bracelets and belts, ear rings, gold cups, bowls, and pots, and much more. 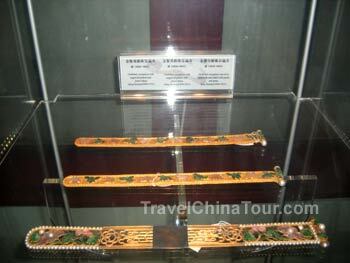 Photo of gold belts on display. 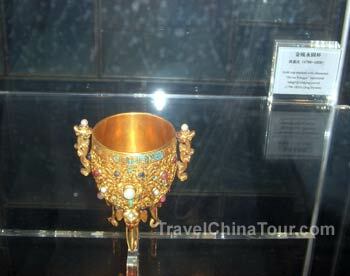 Photo of a gold cup used for drinking. In this area, you'll also see Chang Yin Ge (Pavilion of Cheerful Melodies), which was constructed in 1776. It's a 3 story opera stage, and it is the largest stage in the Imperial Palace. Large scale performances took place here to entertain the emperor and emperesses. The stage can hold up to 1,000 people. After I finished touring the Nine Dragon Screen Wall and the Museum of Imperial Jewlery, I headed back north to exit through the north gate - the Gate of Divine Might. 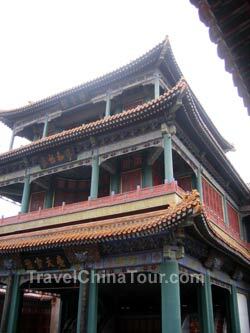 The forbidden palace is huge, and it’s impossible to see everything in great detail. You could spend an entire day there and still not see everything. But for the typical tourist, just touring the key sections will take a good 3 hours or more. 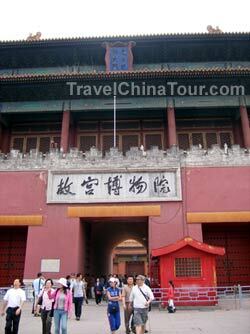 Spending almost 4 hours there, I finished touring the Forbidden City a little after 5pm.